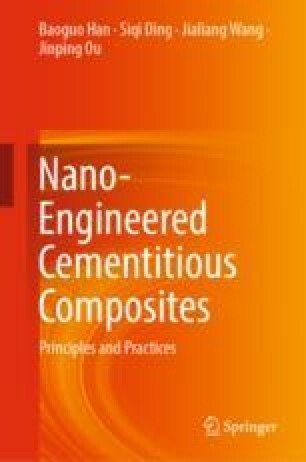 Nano-BN with two-dimensional layered structure is incorporated into cementitious composites to reinforce/modify their properties/performances. The effects of the particle size and content of nano-BN as well as curing method on the mechanical properties/performances and durability of cementitious composites are investigated. The enhancement mechanisms are analyzed through performance, X-ray diffraction, nuclear magnetic resonance, thermogravimetry, and scanning electron microscope tests. Experimental results show that the 0.5% of 120 nm BN significantly enhances the mechanical properties/performances and durability of cementitious composites due to its small size, nucleation, filling, bridging, lubrication, and layered blocking effects.